HILTON HEAD ISLAND, S.C. – Now I know why so many golfers call Hilton Head their favorite get-away destination. It could easily become mine, as well. 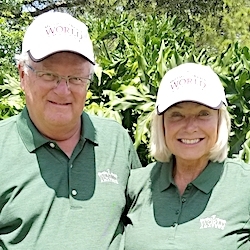 Sea Pines’ Plantation Club just got a new clubhouse…. 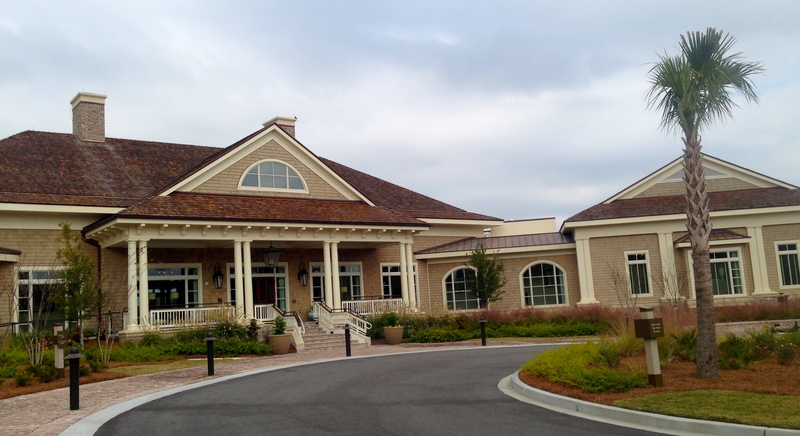 …and this clubhouse at Harbour Town, under construction here, opened in late March. Prior to the early 1960s Hilton Head was basically a stop for hunters and fishermen. Then, in 1962, the Ocean Course was built at the Sea Pines Resort. That opened the gates for a series of rapid-fire developments on the island that now has 38,000 residents and attracts 2.5 million visitors annually. They don’t come just for the golf. Hilton Head also has 13 miles of Atlantic Ocean beaches and eight beach parks, 51 miles of paths for hiking and biking, an extraordinary array of tennis facilities and over 300 restaurants and entertainment venues. The dining isn’t just a load of chain restaurants, either. There are a wide variety of dining options. 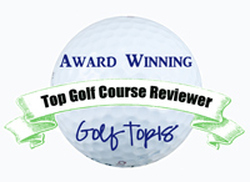 Golf, though, is what Hilton Head is really all about. The island’s golf guide lists 31 courses, and there are packages to accommodate about any kind of get-away you could imagine. 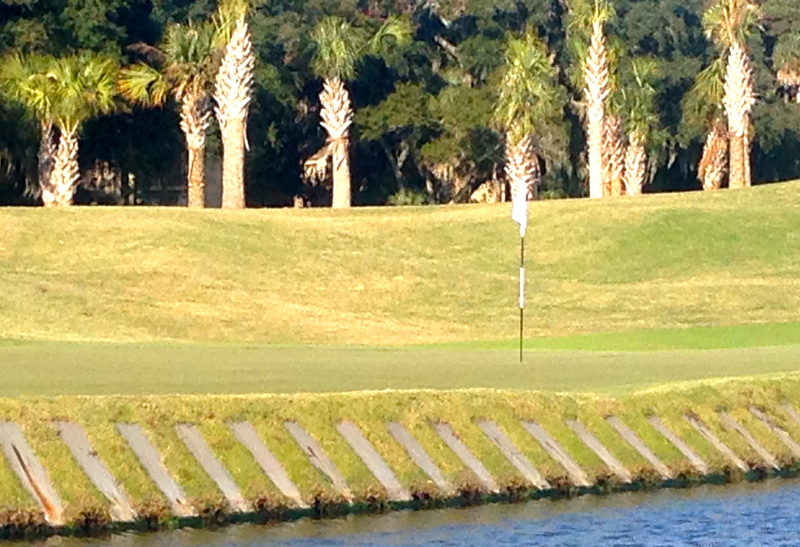 During our stay we experienced a good cross section of Hilton Head golf. The premier layout, of course, is Harbour Town Golf Links at Sea Pines – the site of the PGA Tour’s RBC Heritage Classic since 1969. It had an interesting beginning, with then-fledgling course architect Jack Nicklaus learning on the job from the veteran Pete Dye in what turned out a joint creation by the two of them. We found the lone hole with an ocean view at Palmetto Dunes. It’s behind the No. 10 green. That course has its landmark lighthouse behind the 18th green, a popular visual for golf viewers annually when the Heritage Classic is in the golf spotlight worldwide. We found that there’s a lot more golf in Hilton Head than what’s played at Harbour Town, however, and there’s even a lighthouse that has a much more interesting history than Harbour Town’s — which isn’t a functioning lighthouse anyway. Palmetto Dunes’ Arthur Hills Course has its Leamington Lighthouse, known officially as the Hilton Head Rear-Range Lighthouse. Built in 1879, it doesn’t come into play but is worth more than a glance. It’s haunted, or so the story goes. An 1893 hurricane made a direct hit on Hilton Head and water around that lighthouse was reported to be three feet deep. Adam Fripp, the lighthouse keeper, and his daughter Caroline worked through the night trying to keep the lanterns burning during the storm. Fripp collapsed and died the next day and Caroline succumbed a few weeks later from exhaustion and the loss off her father. Caroline became known as the Blue Lady, and local lore believes she still haunts that lighthouse wearing her blue dress from that stormy night. Anyway, few golf courses can claim such an unusual feature. 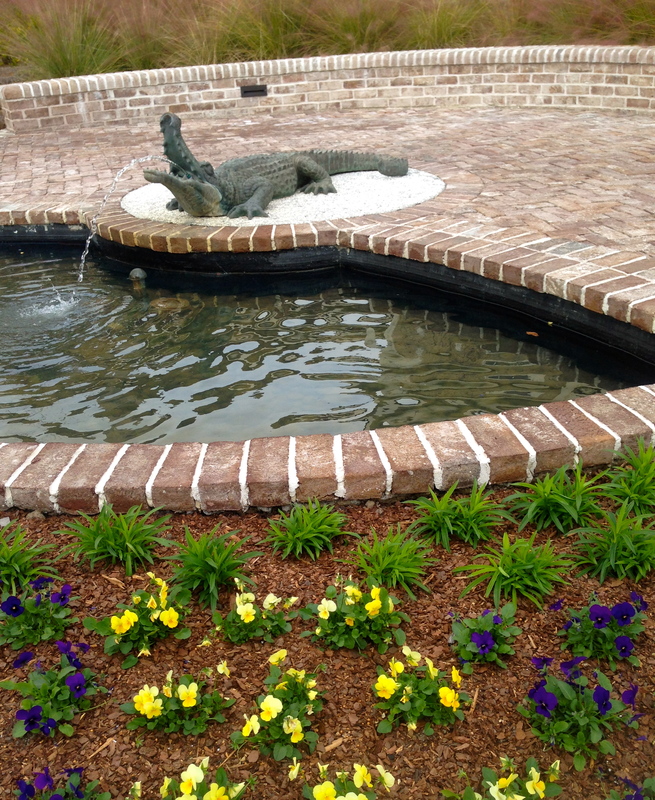 The alligator fountain is the lone remnant left from the old clubhouse at Plantation Club. Palmetto Dunes Oceanfront Resort, which has three courses, has been a Hilton Head fixture almost from the beginning and it’s still going strong — though its name, along with that of its first course, is a bit misleading. The Robert Trent Jones Oceanfront Course, opened in 1969 and rebuilt in 1993, has but one hole with an ocean view. That’s the only ocean view on any of Palmetto’s three courses, and – like the Leamington Lighthouse – the water doesn’t come into play there, either. (The ocean, however, does come very much into play at the resort’s popular beach club). The three Palmetto courses (the others are the Arthur Hills and Fazio) are all a bit different. The Fazio, designed by George Fazio (uncle of Tom) in 1974, is a demanding par-70. 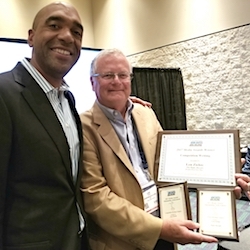 The Hills layout – my choice as the best of the three – is also the newest, having made its debut in 1986. Palmetto has a broad following. Its visitors include many who return year after year, and such longevity is reflected by director of golf Clark Sinclair. He’s been on the Palmetto staff since 1983 and is a huge supporter of the Hilton Head lifestyle. While Palmetto has its charms, it’s at Sea Pines — on the southernmost portion of the island — where the action really is. While all the Hilton Head resorts and golf facilities have been regularly updated – over $200 million has been invested in new construction and renovations in the last few years – Sea Pines has been the clear-cut leader in that regard. That’s in keeping with the style of owner Riverstone Group of Richmond, Va.
Pete Dye again made good use of railroad ties around the 18th green at Heron Point. 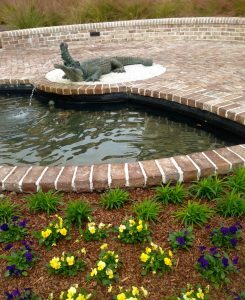 Riverstone also owns another premier South Carolina resort, The Sanctuary at Kiawah island. One of that resort’s courses, Osprey Point, just opened after a renovation and Riverstone’s other golf facility unveiled its own spectacular new course in September. Full Cry, at Keswick Hall in Virginia, is the legendary Dye’s latest creation. 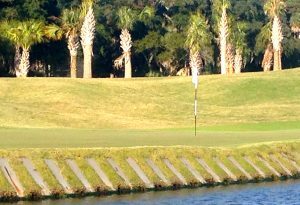 The upgrades At Sea Pines are more far-reaching, and the cost of three recent major ones hit $55 million. The Plantation Golf Club received a spiffy new 23,000 square-foot clubhouse that opened in April and its Live Oaks restaurant is considered one of the best on the island. That was a $17 million project, and the new Sea Pines Beach Club priced out at $13 million. Plantation’s Heron Point course, designed by Dye over what had been the Sea Marsh layout, opened but seven years. Still, it was closed for eight months in 2014 for renovation work before being re-opened in September. Davis Love III will re-design Plantation’s other 18-holer, the Ocean course. That layout will be closed next October and is scheduled to re-open in September of 2016. 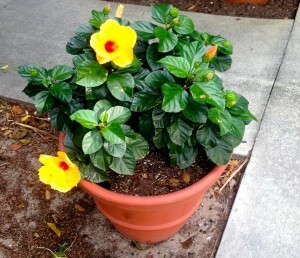 Even in mid-November there was plenty of bright flowering at Palmetto Dunes. Harbour Town, though, is getting the most expensive upgrade – a $25 million clubhouse that was built where the old one had stood. The new clubhouse, which opened well in time for the 2015 Heritage Classic (to be played April 16-19), is a 26,000 square foot structure that has 4,000 square feet for lockerroom space. Shortly after the new clubhouse is up and running the Harbour Town course will close. It’ll be shut down in May, shortly after the next Heritage Classic, to allow for a summer-long renovation in which the fairways will be re-grassed, the greens re-seeded and the irrigation system replaced. These costly projects have kept Hilton Head at the forefront of American golf facilities, but that’s not to say it has everything. There are too many round-abouts for my taste and a few more streetlights would be nice, too. But learning to handle all the turns and cope with the extreme darkness in the nighttime hours is just part of the Hilton Head experience. They’re no big deal, and you get used to it. That doesn’t take long, and then the place really has you hooked.